Facebook has touted the privacy credentials of its new Portal video-chat device – but there’s a catch. Facebook has now said that it may use the data it collects on users in advertising elsewhere. The launch of the Portal and its always-on microphones and cameras comes as Facebook battles a backlash after successive scandals. Facebook’s fancy new video-chat device comes with a catch: Facebook may use the data it collects about you to target you with ads. In early October, the social networking giant announced its first Facebook-branded hardware products, the Portal and Portal Plus – AI-powered smart speakers and video-chat devices that live in your home and let you call your Facebook friends. The devices won’t show advertisements, as company execs told Business Insider and other media outlets when it launched – but that’s not the whole story.Recode reported on Tuesday that Facebook has now admitted that the data it collects about Portal customers, from who they call to the apps they use, may be used in the company’s advertising targeting. This disclosure comes despite Facebook previously telling Recode that it would not in any way utilise the data it collects from the Portal in advertising. “Portal voice calling is built on the Messenger infrastructure, so when you make a video call on Portal, we collect the same types of information (i.e. usage data such as length of calls, frequency of calls) that we collect on other Messenger-enabled devices,” a spokesperson told Recode. In other words: Sure, Facebook won’t show you ads on the Portal. But it will still track exactly what you do and may use that data to target you with ads elsewhere. A spokesperson for Facebook did not immediately respond to Business Insider’s request for comment. The launch of Portal has come at an awkward time for Facebook, as the company faces a consumer backlash and regulatory scrutiny following a chain of scandals, from Cambridge Analytica to the hack of 30 million users’ personal data. 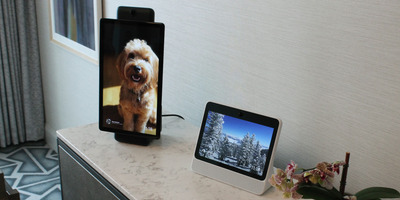 The company has insisted it can be trusted with users’ data, and touted a number of privacy-focused features in the Portal, including a button that turns off the always-on camera and microphone, and a physical cover that can be placed over the lens. However, Facebook’s disclosure that it will still use customers’ data for ads – and the fact it had to correct its earlier statement on the subject – risks turning potential users off.